New Delhi: President Ram Nath Kovind Tuesday awarded two Kirti Chakras and and an equal number of Shaurya Chakras posthumously to soldiers who laid down their lives in Army operations in Jammu and Kashmir and the Northeast. 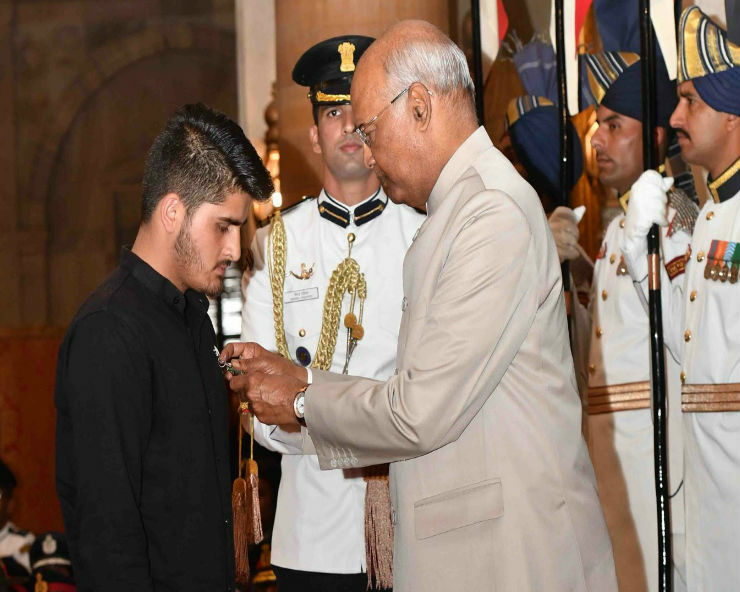 In a rare occurrence, he also awarded a Shaurya Chakra to 16-year-old Irfan Ramzan Sheikh who thwarted a militant attack on his home in 2017. The Kirti Chakras were awarded to Sowar Vijay Kumar of the Armoured Corps and Constable Pradip Kumar Panda of the Central Reserve Police Force. The two died in two separate operations in Jammu and Kashmir. Rifleman Jaiprakash Oraon and Sepoy Ajay Kumar were awarded Shaurya Chakras for their role in counter terror operations in Manipur and Jammu and Kashmir respectively. Shaurya Chakras were also awarded to CRPF Deputy Commandant Kuldeep Singh Chahar, Major Pawan Kumar, Rifleman Rathva Lilesh Bhai, Naib Subedhar Anil Kumar Dahiya, CRPF Assistant Commandant Zile Singh, Havildar Jaweed Ahmad Bhat, Havildar Kul Bahadur Thapa, Lieutenant Colonel Arjun Sharma, Captain Abhay Sharma, Major Imliakum Keitzar, Major Rohit Lingwal and Lieutenant Colonel Vikrant Prasher for displaying gallantry during Army operations in the Northeast and Jammu and Kashmir. Kovind also awarded the Param Vishisht Seva Medal (PVSM) to 13 senior officers of the three armed forces. He presented the Uttam Yuddh Seva Medal (UYSM) to two Army officers, including Lieutenant General Anil Kumar Bhatt, currently the Director General of Military Operations (DGMO). Twenty-six officers of the three armed forces were also awarded Ati Vishisht Seva Medal.